Now aged 64, Scott Gorham’s Californian drawl and amiable personality have refused to fade despite his long established status as a Londoner. It’s been 42 years since he joined Thin Lizzy and three decades since that band seemingly ground to a halt following the death of founder Philip Lynott. 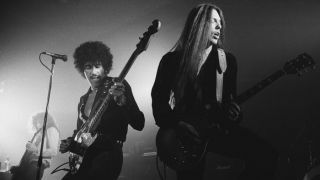 Gorham would be among those to revive the Thin Lizzy name from 1996 to 2001, and again in 2004, before deciding eight years later that the desire to make new music should be fulfilled under a new name. Besides widespread touring, Black Star Riders have since released two albums, All Hell Breaks Loose and The Killer Instinct. Here Gorham explains why Lizzy are back for selected dates to celebrate the 40th anniversary of Lizzy’s breakthrough sixth album, Jailbreak, and thirty years after the loss of Lynott. That’s right. We had demoed maybe 15 songs and were only going to put ten on the album. As a band we chose that ten. It was one of the managers that went through the ones we’d rejected and The Boys Are Back In Town was among them, though it didn’t have any guitar harmonies on it at the time, though the lyrics were complete. So we swapped it over. We were pretty bad at picking the singles [chuckles]. It was these two deejays in Louisville, Kentucky, that made the song a hit by playing it incessantly until other radio stations caught on. I hope people don’t see it that way. We’re not actually doing anything BSR-wise this year; we’re writing and recording a third album. _• _Thin Lizzy play the Ramblin’ Man Fair on July 23.